Now that Mardi Gras is behind us, there's nothing on the social calendar, right? Wrong. It's New Orleans, and there's always a festival or parade just around the corner. In the Crescent City, March brings us two weekends of parades to celebrate St. Patrick's Day, Soul Fest, Fashion Week, the Crawfish Festival, Hogs for the Cause, and countless other events. Locals will not have to look far to find something to do. 47th Annual Al Briede Gold Cup Race (Saturday, March 8th @ 8am) - Honoring a founding member of The New Orleans Track Club, this year's race kicks off the NOTC's annual Grand Prix race series. A new course along the Metairie Lakefront, proceeds benefitting the LASPCE, and a unique running cap for all participants will surely draw a great crowd. Race Judicata 5K & 1 Mile (Saturday, March 8th @ 9:15am) - Loyola Law School presents a run through Audubon Park to benefit Boy Hope Girls Hope of Greater New Orleans. Race day registration begins at 8:30am. Q50 Ultra, Marathon & Half (Saturday, March 8th @ 7am) - High mileage runners get a local opportunity to take on trails with the Q50 race series this weekend. Multiple loops through the Bogue Chitto State Park are a challenge, even for the most experienced runner. 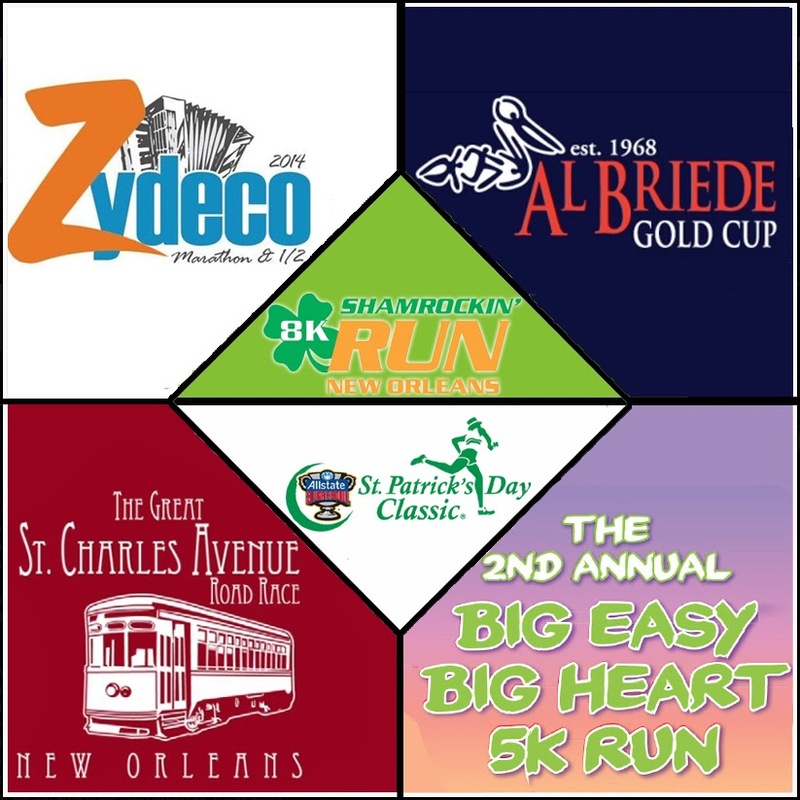 Big Easy Big Heart 5K (Sunday, March 9th @ 8am) - Starting and finishing at the French Quarter location of Jimmy Buffet's Margaritaville, the race benefits the New Orleans Mission and their womens' services. Over a thousand runners are expected for the second year of this growing race. New Orleans Underwear Run (Thursday, March 13th @ 6pm) - A fun run through the New Orleans Warehouse District will surely be a spectacle to see. The course is a brief 1.2 miles, and finishes with a post-race party at Lucy's Retired Surfer Bar. Shamrockin' Run 8K (Sunday, March 16th @ 8:30am) - Runners and Guinness Challengers hustle from downtown to uptown New Orleans along Prytania Ave. and finish in Audubon Park. Then, while at the finish festival, participants get to spectate some of the fastest runners in the world compete for a prize purse of over $70,000! St. Patrick's Day Classic 2 Miler (Sunday, March 16th @ 10am) - The ONLY 2-mile qualifying course for the CCC10K follows the Old Metairie route hours before parade time. The point-to-point route will be lined with the most spectators of any race in the Crescent City. Great St. Charles Avenue Road Race 10K, 5K, 1 Mile (Saturday, March 29th @ 7:40am) - Enjoy an Uptown 10K Course that takes participants around Audubon Park, or a 5K / 1 Mile dash up and down St. Charles Avenue with this race. After you get done running, stick around for a post-race performance by New Orleans' own 610 Stompers! Reveille at Oak Alley 5K & 1K (Saturday, March 29th @ 8am) - Finishing under the oaks at the Historic Oak Alley Plantation is a highlight of this annual race, with the top 500 5K finishers and 100 1K finishers receiving commemorative medals for their accomplishment. The Monk Run 5K & 1 Mile (Saturday, March 29th @ 8am) - The Monk Run takes place on the grounds of Saint Joseph Abbey; and while the race is a fun run, beautiful handmade awards are presented to overall and top age-group finishers. Race For the Fallen Half Marathon & Relay (Saturday, March 29th @ 7am) - Run the shores of the Gulf in Bay St. Louis, where race proceeds benefit The Police Benevolent Foundation. Zydeco Marathon & Half (Sunday, March 30th @ 7am) - An inaugural event in Lafayette, more than a thousand pre-registered runners will be participating in the 26.2 or 13.1 mile courses. This spring marathon is a welcomed race in southern Louisiana! I'll be on the lookout for other races as they pop up in my social media news feeds, and they'll get added to this rundown (pun intended) continually. Check back frequently and Like NOLArunner on Facebook HERE for updates! Great List! I enjoyed the Q50 Trail Half Marathon this month. Have fun at Zydeco this weekend!